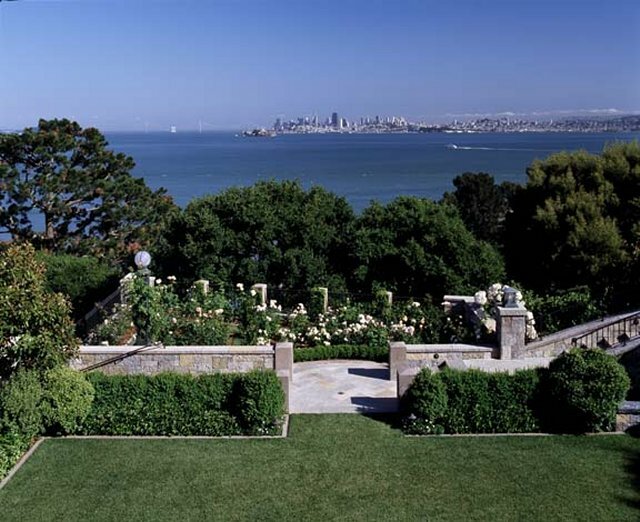 At the turn of the Century, Gordon Blanding, a wealthy San Francisco lawyer bought the Belvedere landmark home built by C.O. Parry, first treasure of Belvedere which included 30 acres on the southern tip of Belvedere Island. He spent ten years to develop a large estate, which consisted six residences and several ancillary buildings. The Blandings lived full time in the main residence known as "Locksley Hall" after the 1906 earthquake destroyed their home in San Francisco. 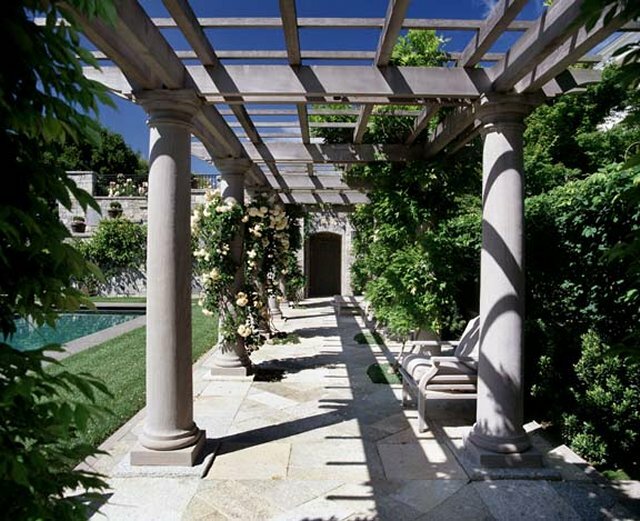 The world renowned Hearst Castle architect Julia Morgan designed the bronze gates and lanterns on rusticated stone pillars at entry and in the garden. 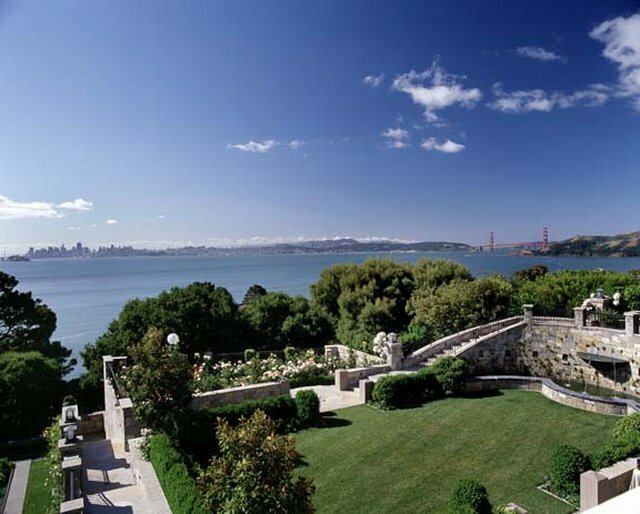 It frames the magnificent garden and the breathtaking views of San Francisco, Golden Gate Bridge, Angel Island and Bay. 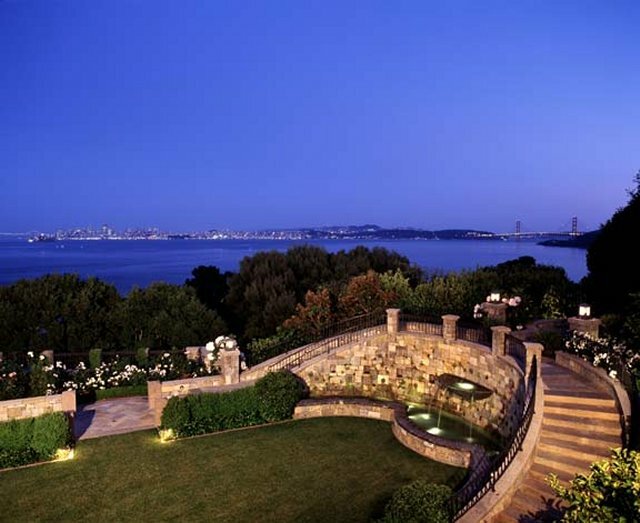 Upon entering the gate, one enters an enchanted setting, ambiance and beauty no other homes could match. 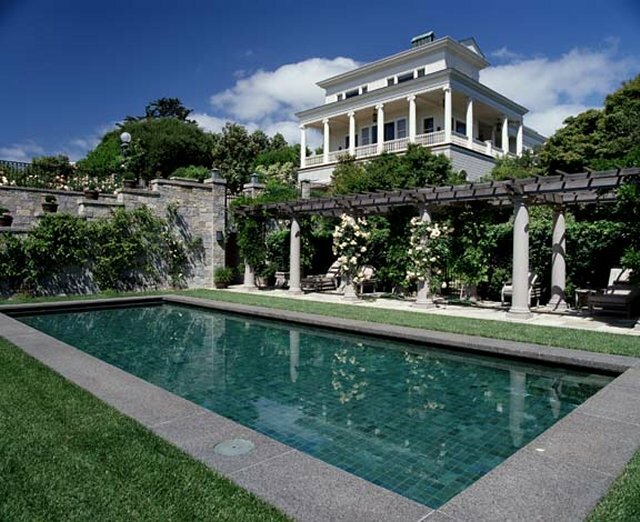 The current owner has painstakingly restored the estate to its finest splendor and yet retained most of the historical and architectural interior and exterior detailing of this unique Landmark house which is reduced from property taxes under Mills Act. 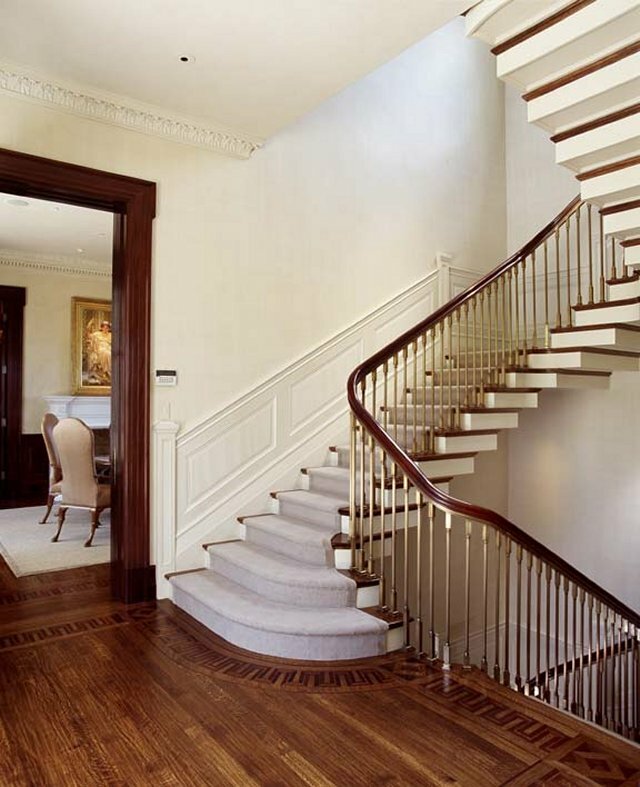 The covered Entry with 15 foot high ceiling opens into a Foyer with grand staircase of bronze balustrade and polished mahogany railing. 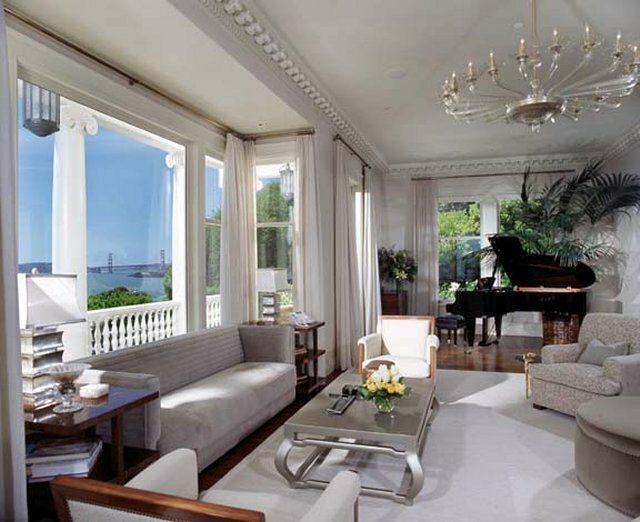 To the right is the Living Room with magnificent views of San Francisco, Golden Gate Bridge, Angel Island and the Bay. 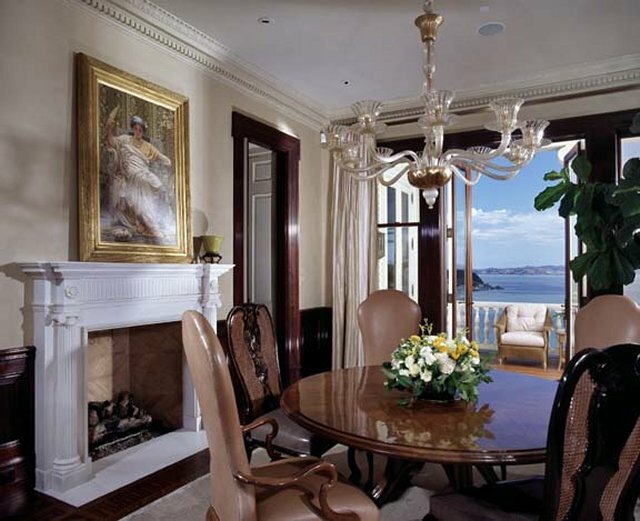 To the left is the elegant Dinning Room with hand glazed walls and Mahogany wainscoting, fireplace and the richly polished Mahogany paneled library. 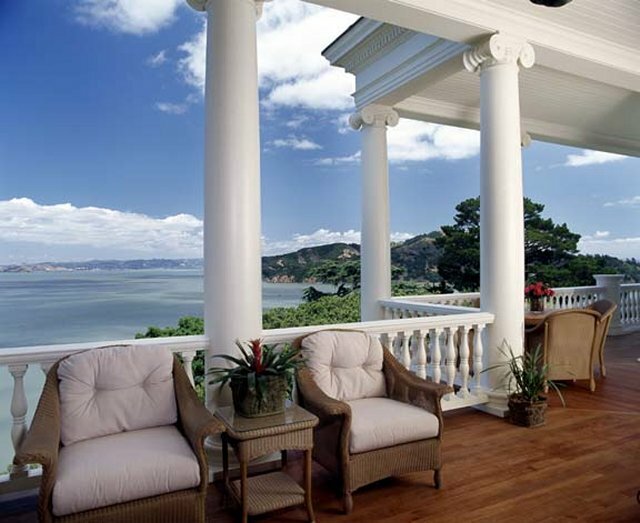 The gourmet Kitchen with Breakfast Room, Butler’s Pantry is to the east and a wrap around veranda with towering Corinthian columns, moldings, bronze sconces and teak decking on east, south and west side of this floor offers spectacular panoramic views. Great Room services as office and entertainment room features state-of-the-art computer, video and audio systems, Mahogany doors, hardwood floors in herringbone pattern, alabaster bowl disk pendant lamps, recessed lighting, linen panel drapes, coffered 15 foot ceilings with raised panel walls of hand glazed finishes and a fully equipped Kitchen with top of line appliances. 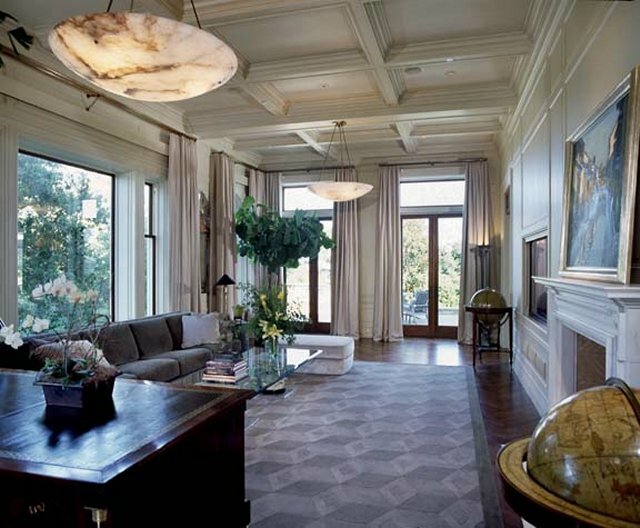 Three Guest Suites each with sitting area, marble bathroom, Mahogany doors, hand glazed painted trims, ceilings and paneling. 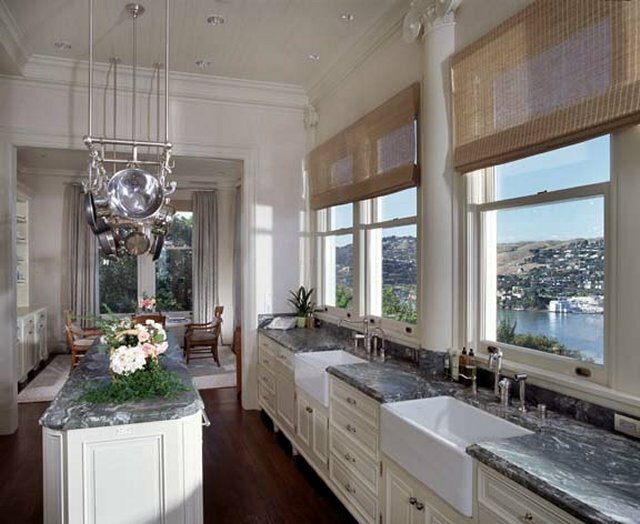 There is also an exquisite marble Powder Room and professional Laundry Room and ample Storage. Luxurious Master Suite with sitting room, fabulous bathroom with woven mosaic marble tiles, double showers, spa tub, spacious walk-in closets, and a fully equipped office with a service kitchen that could be converted to bathroom as another bedroom. 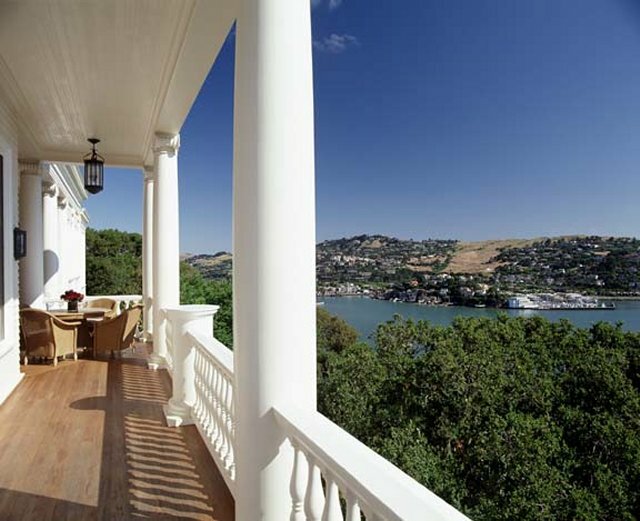 This floor offers breathtaking views of San Francisco, Golden Gate Bridge, Angel Island, Bay Bridge, Alcatraz Island, Tiburon and both Corinthian and San Francisco Yacht club harbors. There are teakwood decks off to the south and east. 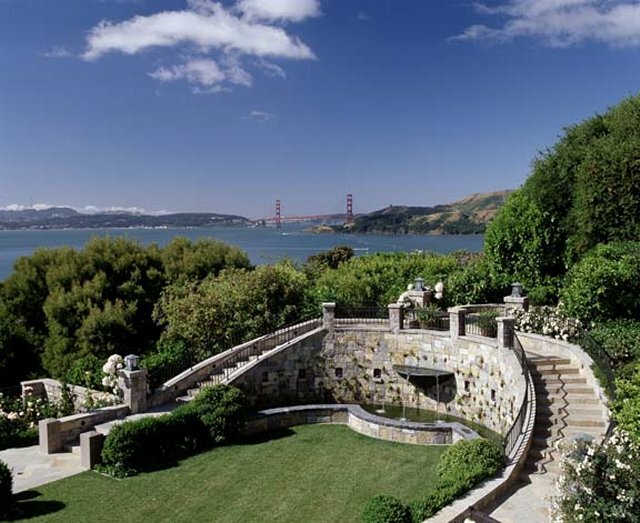 Antique paving stones from China created paths and steps throughout the gardens first to a lawn, a rose garden, bronze balustrades, and a custom designed bronze fountain that can be accessed also from the Great Room and a Guest Suite. Then descend to a Burmese teak beamed Pergola leading to the pool with Indonesian Batu-Hijau stone lining, flamed granite coping and electric pool cover. A Pool House with Sauna, Steam Bath/Shower with Fossil Stone coping, mosaic walls and floors, seashell wall sconces and marble countertop, complete with indoor/outdoor Sound Systems Fountain/Spa control and Telephone Points. 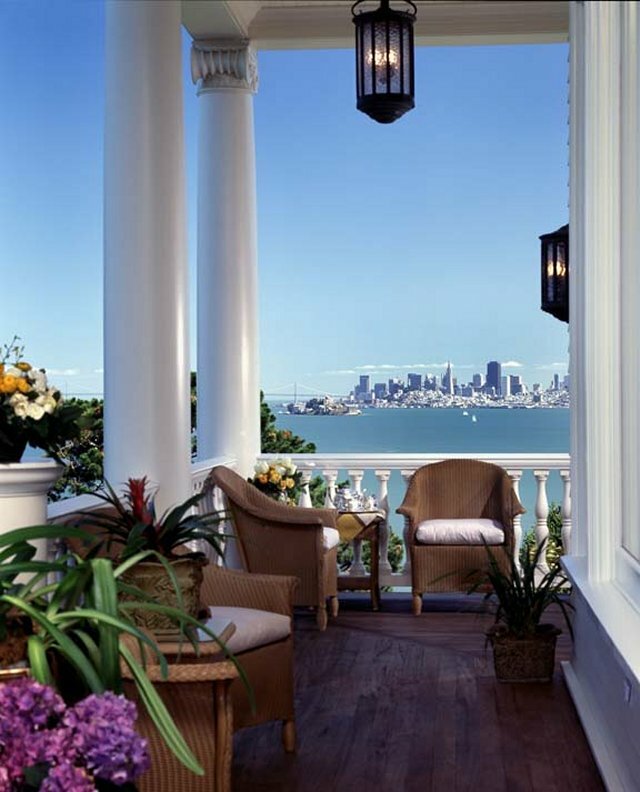 A spacious hot-tub with Fossil Stone coping is a peaceful spot to enjoy the incredible views of San Francisco skyline and watching the sail boats go by. 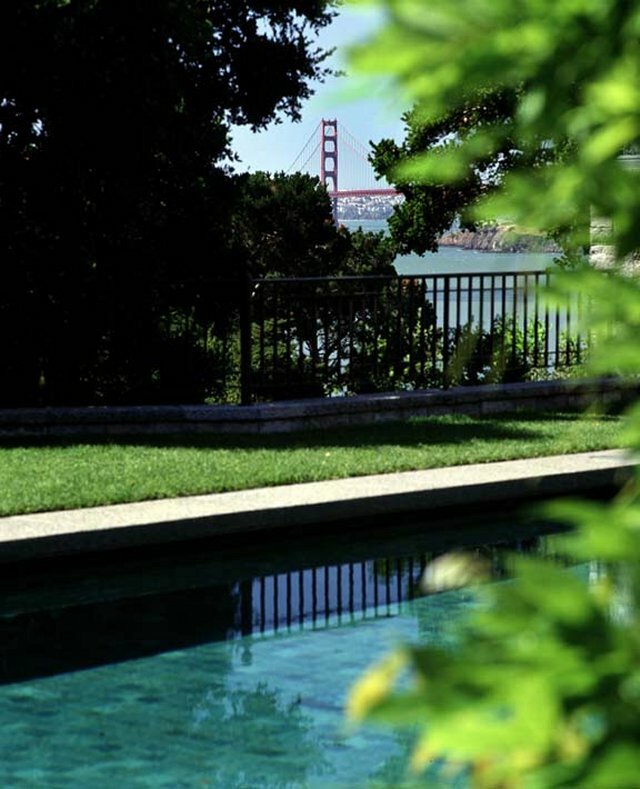 There are various spots in the garden with serene setting and total privacy. 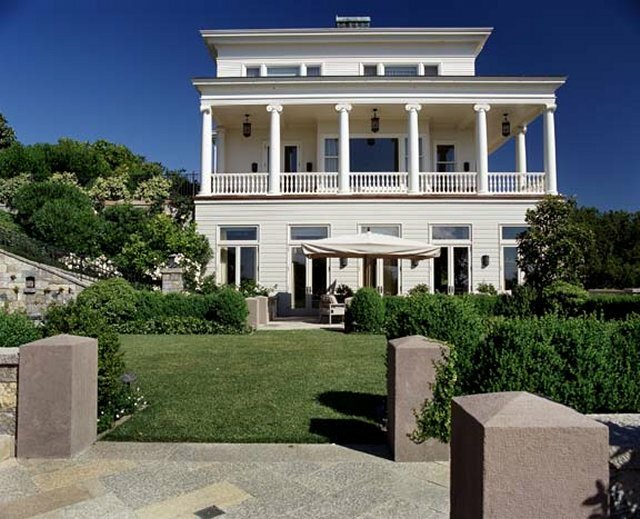 Landscaping by Stephen Suzman Design has imported exotic, specimen plants, flowers, and matured trees from around the world. Separate from the house on the kitchen side, this apartment has a marble full bath, top of line equipped kitchenette, hardwood/carpet flooring, telephone/TV/LAN points. Garage for two cars with hydraulic operated electronic driveway gate made of 4,000 pounds bronze and two separate bronze pedestrian gates, all with closed circuit TV surveillance monitors and intercoms. Full security system with smoke and heat detectors. 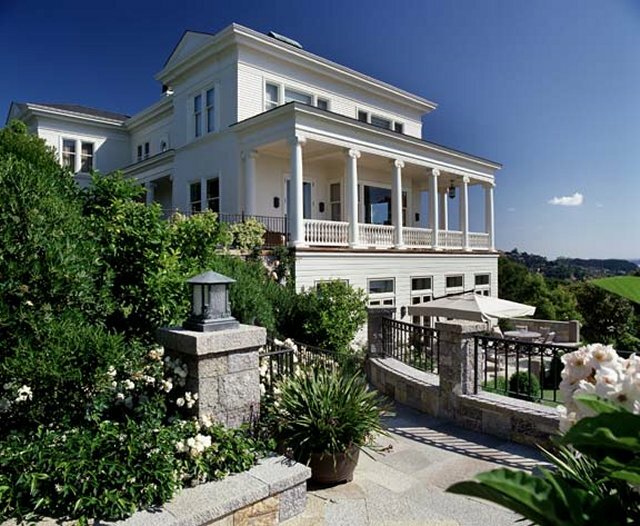 Completely new systems throughout including plumbing, electrical, windows/doors, all structures, foundation and roofing. Polished Mahogany doors, trims and moldings throughout. Hand glazed wall finishing in all main rooms. 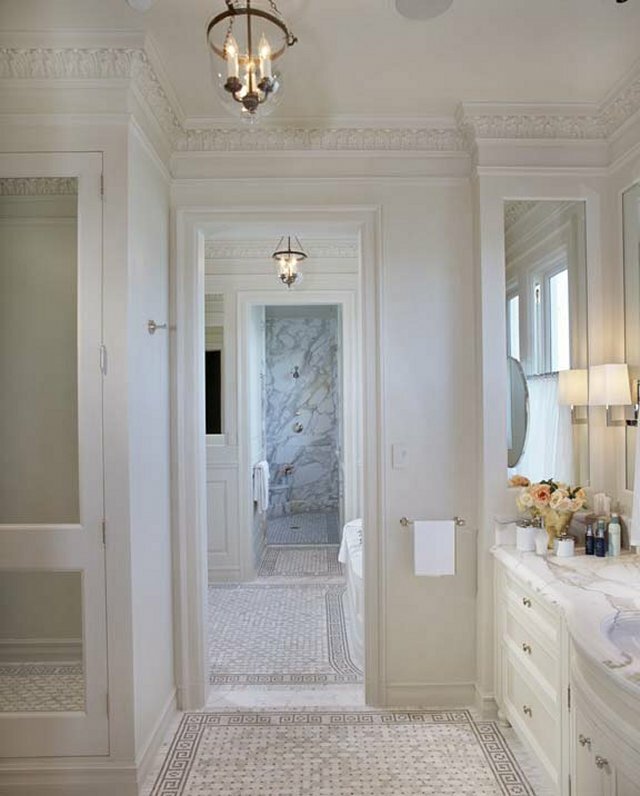 Marble bathrooms with custom designed fixtures throughout. Panel drapes, linen sheer, bronze finish rods and pleated blackout blinds in most of the rooms.